Full set doll - With second set of hands. Full set doll - With second set of hands. Black Saran wig pulled up into Asian style buns, parted down the center with bang and side tendrils. Kimono style jacket with detailed embroidery on the back, over a red satin bustier accented with black Chinese frogs, black and cream brocade skirt. Black "Geta" style, high heel sandal with red thong toe straps. Gold metal jewelry with real tiger eye stones. Full set doll - Deep red Saran wig. Silver brocade dress with silver ribbon trim, silver metallic trench coat, both lined in pink taffeta and matching silver metallic leatherette shoes. Silver tone hoop earrings and wire bangle bracelets (one with rhinestone accent). A portion of the proceeds will go to the American Heart Association for the "GO RED For Women Campaign". Black Saran hair in a chignon updo. Red crepe satin jump suit with long over skirt and rhinestone buckle, red and clear rhinestone necklace, bracelet and earrings. Matching red satin shoes. 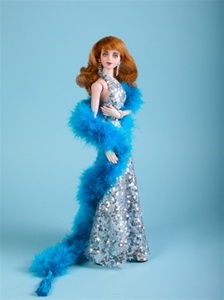 The most poseable 16" Fashion Doll in the world! Fully painted face with blue eyes. 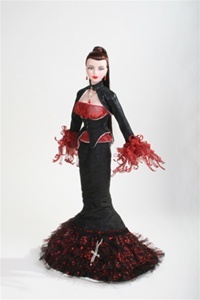 Elaborately stylized dark red shark-skin taffeta dress with crystal accents. Long black gloves, black organza opera coat, black petticoat. Black satin and glitter spike heels with buckle accent. Custom made rhinestone earrings and necklace. Full set doll - Red Saran wig pulled to a side ponytail with side part and bangs. Black leatherette jump suit with inset panel of contrasting fabric and front zipper and matching belt with silver buckle. Black and Clear square rhinestone earrings, black sunglasses, dog (random breed) and carrier , black calf high leatherette boots with buckles. With 2nd set of hands. Pet not included. Brown, multi color and gold lurex tweed jacket over a strapless, light taupe, mini dress, covered by a 3 layer chiffon skirt in dark brown, chocolate and light taupe. Dark brown felt "Top Hat" with ivory satin ribbon and perfect feather. Brown leatherette and ultra suede boots. Gold tone metal and rhinestone jewelry complete the look. 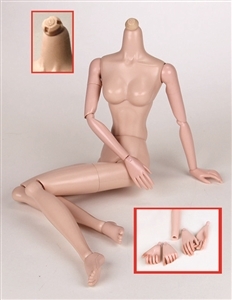 Full set doll - Blond saran hair pulled up in a ponytail with long side part bangs. Multi colored chiffon wrap halter top with red rhinestone accent. Long white matte dupioni skirt with inset of the chiffon with red belt. Dazzling red rhinestone earrings and red shoes. Full set doll - Long bright copper saran hair with sides pulled up in braids. Aqua satin long gown with chiffon flounce at the bottom and coordinating, asymmetric one sleeve jacket of chiffon in beautiful colors of the desert. Turquoise bead earrings and gold strappy sandals. 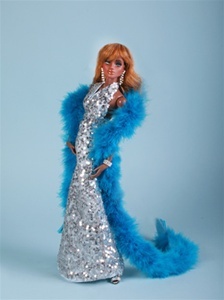 Custom designed silver sequence overlay evening gown. Custom made rhinestone earrings and bracelet. 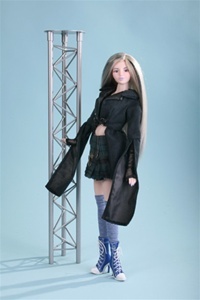 16" Fashion doll, made of ABS and Vinyl. with wig, Mechanically Ball Jointed*, which hold the position better. Elaborately stylized costume and accessories. 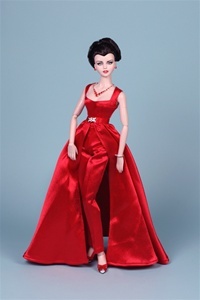 16" Fashion doll, made of ABS and Vinyl. with long rooted hair, Mechanically Ball Jointed*, which hold the position better. with detachabe face plate and painted green eyes. 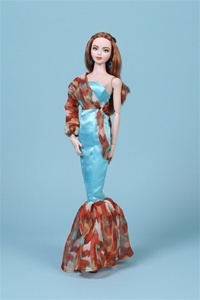 16" Fashion doll, made of ABS and Vinyl. 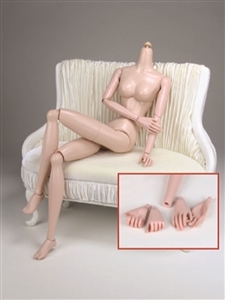 with blobde wig, Mechanically Ball Jointed*, which hold the position better. 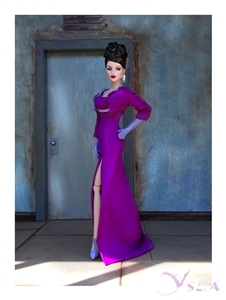 16" Fashion doll, made of ABS and Vinyl. with rooted hair, Mechanically Ball Jointed*, which hold the position better. Elaborate earth tone stylized costume and accessories. Earth tone plat form sandals. 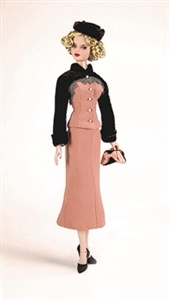 16" Fashion doll, made of ABS and Vinyl. 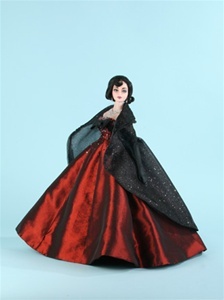 with Synthetic Mohair Wig, Mechanically Ball Jointed*, which hold the position better. Light silver and white costume with feather wings and star / moon earrings. Gray and red costume with smoke like train and fiery earrings. Aqua water flow costume with complimentary necklace and earrings. NOT FOR Gene type dolls. 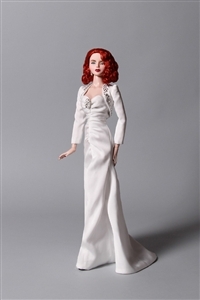 Replacement Body for Gene Type Dolls with 2 sets of hands.. The world's most possible Vita body with a special adapter neck plug. Urban Vita "Hot Hot Hot"